Last evening I spent a couple hours at JP Knit and Stitch in Jamaica Plain, MA at a one woman quilt show featuring the work of Joyce Adams. It was like no other quilt show I've ever attended! Because there isn't a lot of space in the shop at JP Knit and Stitch, only a few of Joyce's quilts could to be put up on display. That left a stack of great quilts which were all folded up. Joyce was happy to have folks touch her quilts so we had a quilt showing! A wonderful group of Joyce's family, friends, and visitors all gathered around the semi-circle of window seats in the shop. Each quilt was unfolded one at a time, rested on the coffee table but also held by the hands of the women in the circle of viewers. Joyce talked about each quilt and answered our questions about fabric, construction and quilting. We were really able to share her quilts with her. It was so much fun! Joyce told us that she remembers that as a little girl, she watched her Mother, Essie, make a quilt with lots of wonderful colors. It is in her honor that Joyce started quilting about 10 years ago. Each quilt Joyce makes is dedicated to someone special! Joyce is a self-taught quilter. 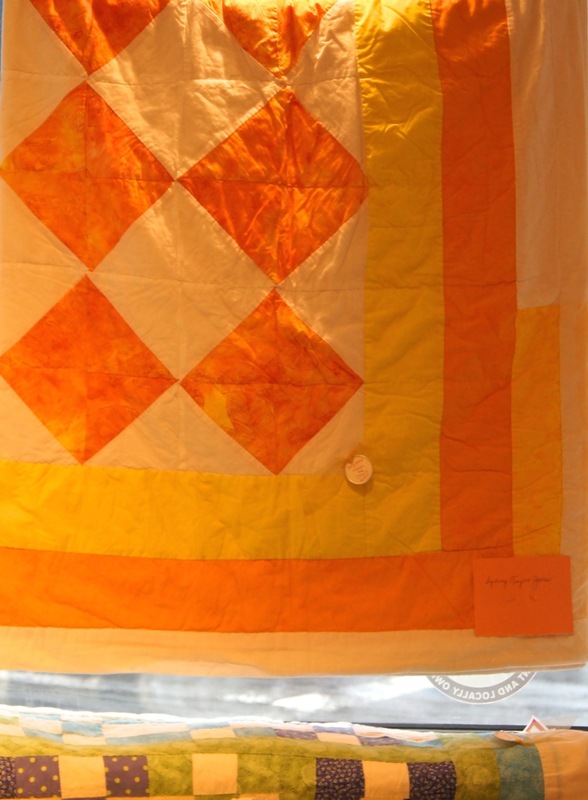 She uses purchased quilting cotton solids and prints, cottons saved from special clothing and white or cream muslin. Her quilts are entirely hand-pieced and hand-quilted. They are so soft and drape beautifully. Each quilt design is her own creation. Her husband, Ed, a retired printer, is her color consultant. Ed was there last night, and we enjoyed talking to him too! 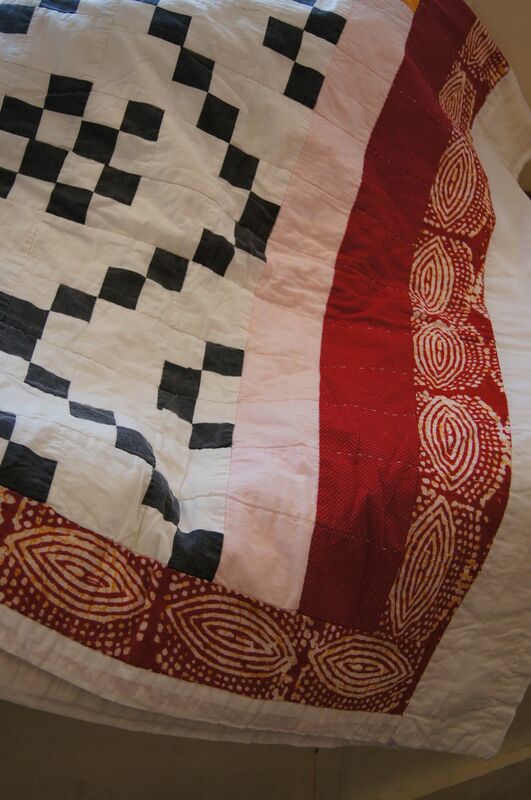 Here are a few photos of some of Joyce's quilts. The photos only show a small portion of each quilt but they will give you an idea about these bright and delightful quilts. (The photos are in a slide show and should change every 3 seconds. You may also use the arrows to manually scroll through the gallery). The quilts are only at JP Knit and Stitch for a couple days. I hope you get a chance to stop by and see them. Most of the quilts are folded up. Touching is permitted--just make sure your hands are squeaky clean! Joyce Adams gave me permission to photograph her quilts and write this blog post on October 2, 2014. Please note: At the request of the quilter, Joyce Adams, please do not photograph her quilts. You may not copy or otherwise reproduce or transmit any of the photos in this blog post without her express permission. Thanks for honoring this request.